Although its crown was initially given to Joseph Bonaparte, the brief history of the Napoleonic Kingdom of Naples will be forever best associated with the reign of King Joachim Murat, Napoleon`s famous and flamboyant cavalry commander, from 1808 to 1815. Known more for the splendour of its uniforms than the achievements of its troops, Naples under Murat nevertheless became a major, if short-lived, player on the Italian Peninsula. 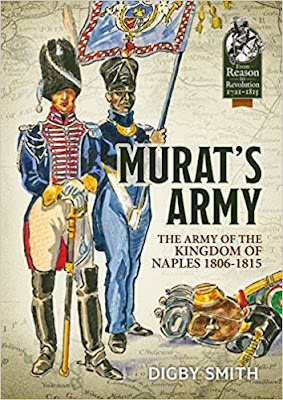 This book is based around a series of 99 plates from the work of the military illustrator Henri Boisselier covering the army and navy of the Kingdom of Naples, reproduced with the kind permission of the Anne S.K. Brown Collection. Each plate is accompanied by a commentary on the figure, comparing Boisselier’s depiction with the actual state of the army at the date of their portrayal. The accompanying text details the strength of each corps of the army (royal guard, infantry, cavalry, artillery, engineers, command and staff officers, and civilian para-military organizations) including the dates of raising of each regiment, their uniform details, badges of rank, inter-company distinctions, flags and standards. The battle history of the units is also recounted, and supported by maps and orders of battle. These details are supported and contextualised by a brief history of the kingdom.